The surprising events surrounding the initial publication of Srila Prabhupada's Bhagavad-gita As It Is. The Bhagavad-gita was important to Srila Prabhupada. He saw it as the perfect book to convey Krishna consciousness, as it consists of the Lord's own words and His interactions with His loving devotee. In 1939, just seven years after Prabhupada was initiated by his spiritual master, he wrote a lengthy introduction to the book in English, presaging his full translation and commentary, which appeared soon after he began his mission in the West. When Prabhupada arrived in New York in 1965, he gave priority to his work on the Gita. In India he had already completed a translation, spanning well over a thousand pages, but it was stolen. In March 1966, Prabhupada was adjusting to life in the Western world when he met with another loss: his typewriter, cassette recorder, and several books were taken from him. But he was resilient and determined to complete his work. In 1967 he finished the new manuscript, again over a thousand pages, and resolved to get a major publisher so that his message would be heard throughout the world. At the time, Allen Ginsberg, famous poet of the Beat Generation, was visiting the New York temple, and he was enjoying a friendly relationship with Srila Prabhupada. Since Ginsberg was an experienced published author, Prabhupada asked him to show the manuscript to his benefactors, which Ginsberg did. But they were unimpressed, claiming the book had little commercial value. Prabhupada then gave the manuscript to Rayarama Dasa, an early disciple with some experience in the publishing world. Rayarama, too, was unsuccessful in his attempts, his contacts explaining their hesitation in much the same way that Ginsberg's did. Enter Brahmananda Dasa (Bruce Scharf), one of Prabhupada's earliest disciples. He vividly relates the story as if it were yesterday, though it was more than forty years ago. "I didn't know anything about publishing," he admits. "But Prabhupada put the manuscript in my hands, saying, 'You must get this published.' So I knew what I had to do." What he didn't know was how to do it. If Ginsberg and Rayarama couldn't get the book published, how would he? "I bought a couple of books on publishing, and I was about to take a publishing course at New York University-I just didn't know what to do. Still, Prabhupada wanted me to get the book published, and that was that." Around this time, the devotees had released the "Happening" album, an assortment of devotional songs sung by Prabhupada with musical accompaniment. They had placed an ad for the record in the Village Voice and were receiving orders from various parts of the East Coast. One such order came from uptown Manhattan, relatively close to the little storefront serving as a temple for Prabhupada and his early disciples. Brahmananda brought the letter to his master. "Look, Swamiji [as Prabhupada was then called]. It's an order from Macmillan. They're one of the biggest publishers in the world." Prabhupada gazed knowingly into his disciple's eyes and gave the following directives: "Do not mail out this order as we do with others. Instead, bring the record to Macmillan's offices and hand deliver it to the person who sent us the letter." Brahmananda nodded, aware that Krishna was using him as an instrument. "When you deliver the album," Prabhupada continued, "tell them that you are a disciple of a guru from India and that he has translated the Bhagavad-gita. They will publish it. Do not worry." Brahmananda was stunned. Prabhupada seemed so confident. There was no doubt the book would get published-and by Macmillan! One couldn't do much better than that. The next day, dressed in suit and tie, Brahmananda made his way up to the Macmillan skyscraper at 866 Third Avenue, just off 52nd Street. His expectations as large as the building itself, he was disappointed when he learned that the order for the album had come from a clerk in the mailroom. "This really had nothing to do with the publishing company-it was just a simple worker who had some interest in mantras and meditation." So Brahmananda dutifully delivered the album and had pretty much given up hope that his teacher's Gita would get published. Just then, in the midst of polite small talk with the clerk, a young executive happened to appear, hoping to collect his mail. The clerk introduced him to Brahmananda. "This is James O'Shea Wade, our senior editor." "I am a disciple of a guru from India," he said, trying to repeat Prabhupada's words verbatim. "He has translated the Bhagavad-gita." "What?" Wade responded, incredulously. "We've just published a full line of spiritual books, and we were looking for a Bhagavad-gita to fill out the set." Brahmananda's mouth dropped open. Though at a loss for words himself, he contemplated the potency of Prabhupada's: "They will publish it. Do not worry." "You bring in the manuscript tomorrow," he offered, "and we'll publish it, sight unseen." Brahmananda raced back down to the storefront and told Prabhupada the news. In his own inimitable way, Prabhupada was nonchalant, as though he knew what would transpire before it happened. Now, are these the memories of an over-zealous disciple, an exaggerated footnote in ISKCON's forty-year history? I decided to find out. I found James Wade, and he confirmed the events in question. He remembered the incident with tremendous clarity, supporting Brahmananda's story. And he offered an addendum. "I vividly remember the stir caused in our rather sedate and boring office the day the Swami came to visit, accompanied by followers in orange robes." Apparently, Prabhupada himself brought the manuscript the day after Brahmananda's brief visit to Macmillan. 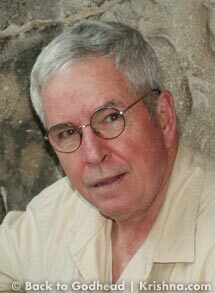 Wade shared his thoughts about Prabhupada's spirituality. "I remember the Swami as being a very imposing and striking figure, with a powerful spiritual aura. His like had never before been seen in the Macmillan offices. Around that time we also published Alan Watts and John Bleibtreu, who was involved in the spiritual and communal movement called Arica. Macmillan had a tradition of publishing books about spirituality and religion at that time. I think that ended not long after I left to become the editor-in-chief of the now defunct World Publishing Company. But the Swami was special. That was clear." I asked Wade to elaborate on that fateful meeting. "Our office was a rather austere, coolly modern place as far as decor. I remember having some apprehension about how comfortable the Swami would feel in this rather alien setting, but it turned out that he was a man who was at peace and at home in any environment. I remember him as a rather tall man, physically imposing. But of course, he wasn't, being rather small in stature and not at all daunting. Quiet, modest, and surrounded by a kind of stillness, a peacefulness that was, well, welcoming. I can't think of a more precise word. He was in the world and, at the same time, not of it. He knew that we live in a world of illusion-something science has also taught us, as we go from sub-atomic particles and quantum mechanics to string theory. I remember that he wanted the Bhagavad-gita As It Is to get the widest possible exposure in the US. As I recall, things like the Hare Krishna movement were in the very early stages. Alternative spirituality-ranging from Zen to Tibetan Buddhism, for example-had not then touched the minds and spirits of people the way such alternatives do today for so many." James Wade was senior editor at Macmillan from 1965 to 1969. But in his few years at their offices, he made history by publishing a pure devotee's edition of the Bhagavad-gita. The abridged version came out first, in 1968, and because of seeds James Wade planted, Macmillan published Prabhupada's unabridged Bhagavad-gita As It Is in 1972. Srila Prabhupada's translation and commentary are not merely his own; they bring to bear the insights of his predecessors in disciplic succession. And so he titled his edition "As It Is." The name boldly announces to his readers that this is not yet another interpretation but rather the original message of the book's initial speaker: Krishna, the Supreme Personality of Godhead. 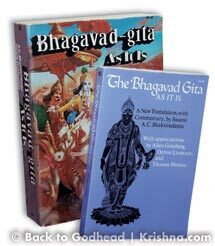 Accordingly, Prabhupada's Gita was the first English edition to bring people to Krishna consciousness, to make them devotees of Krishna, which is the book's intended purpose (see Bg. 18.65). Prabhupada's Gita went on to become the most important edition in the modern world, often outselling both popular and scholarly translations. Claiming millions of readers in some fifty-five languages, from Polish to Japanese, German to Azerbaijani, Danish to Croatian, English to numerous Indian languages, Srila Prabhupada's Gita is a phenomenon. It can be found in homes, bookstores, research libraries, and academic institutions around the world. The history of Prabhupada's meeting with Macmillan shows that James Wade, then a senior editor, served as an instrument in the hands of Krishna, who had already signed the contract.